A combination of anthropology and poetry made for a unique experience for Slow Art Day 2012 at Arizona State Museum in the United States. Rather than displaying artifacts as stand-alone pieces, this anthropology-focused museum uses them in context to illustrate cultural and historical stories. So weaving storytelling into Slow Art Day made for a unique approach to this event. Working with the docents from the University of Arizona Poetry Center, the museum invited visitors to read a haiku poem written by one of the docents and find the object that it described or to discover a piece on exhibit that interested them. They were asked to really look at the piece slowly and then write their own haiku poem about it. Imagine using your five senses to get to know the piece—how would it feel, smell, sound, taste? What colors is it? What is it made of? Imagine having a dialogue with the object—what action words would express its story? Think about its history—how it might have been made, used or experienced and by who? Look at the label and make connections. Over 100 poems were written and transcribed onto a large piece of butcher paper, which is now on display at the Poetry Center to encourage people who see it to visit the the museum and figure out which objects inspired them. 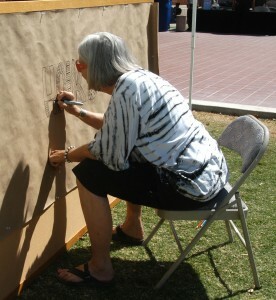 For more on Arizona State Museum’s Slow Art Day experience, visit their blog. –Report by Lisa Falk, Arizona State Museum’s Director of Education. Edited by Slow Art Day blog editor Jennafer Martin. 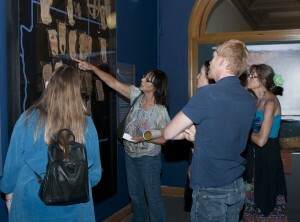 Photographs courtesy Christine Baines and Arizona State Museum.